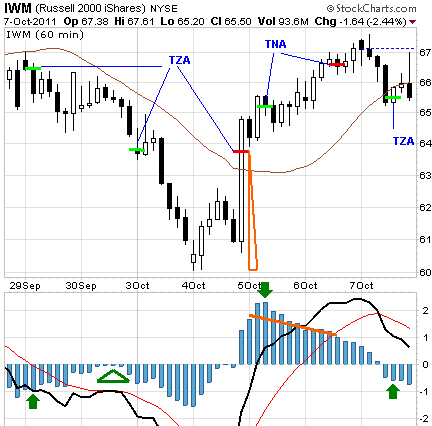 SPY rose by 2.3% this week, while my account rose 0.3% to its highest value in eighteen weeks. Not bad, especially considering what happened on Tuesday: After the expected market drop on Monday, the market then rose 5% in just the last hour of Tuesday! I think a lot of traders lost their shirts that day. Euro news: A bank called Dexia has failed. The government of Belgium is talking about nationalizing it, but Dexia’s liabilities are greater than Belgium’s GDP. This *might* be the beginning of the cascading worldwide banking-system failure that some pundits have been predicting for months (and others have been predicting since 2007). RPRX: Another solid week of red underlines every day, indicating that the put-options are underpriced. As long as that continues, I can’t sell the option and then ride the stock back up (not that it looks to be going up a lot any time soon). Cash: I’ve been keeping a large pile of cash in recent weeks. That’s okay as long as the US dollar is rising (up 0.22% this week compared with other G7 currencies; up 6.0% for last month). I am keeping a lot of “dry powder” in case I need to pile into TZA for the once-per-generation crash that many are predicting. 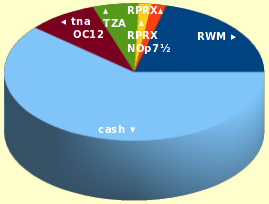 This week, all the action was in the TNA/TZA swing trades. In the chart at right, the brown line is the 20-hour moving average. The bright green and red lines indicate buying and selling, while the dark green and orange symbols are justifications for buying and selling. The light blue histogram is the PPO(5,30,10) indicator. Last Thursday, the market’s PPO was down to -1.0, so I bought TZA. Last Friday afternoon there was a cusp on the PPO histogram while the corresponding peak on the price chart stayed below the moving average, so I bought more TZA at Monday’s open. This went very well and I made more money on Monday than ever before, but I had to give it all back on Tuesday when the market zoomed up during the final hour, triggering my trailing sell-stop. The net effect was that the second tranche of TZA got sold for approximately what I paid for it, but the profits on the first tranche were saved. My trading system worked! On Wednesday, when it became clear that Tuesday’s zoom-up was going to be more than just a one-hour wonder, I bought TNA. I sold it on Thursday because PPO had declined more than 0.35 over an 11-hour period. The price of TNA continued to rise for several hours after that, but then sold off so “close enough”. On Friday I bought TZA again, even though PPO wasn’t really quite negative enough yet to justify that. I was at a bowling alley and pleased to find that they had wi-fi! Also, I wanted to have plenty of bearish tilt in my porfolio to prepare for the Monday morning gap-down if we get one. The market then went up for several hours after my purchase, plummeting back to my entry-point in the final half-hour. I feel like I am now well-positioned for next week.